My husband has been working like a trojan this week, so I treated him to Sunday lunch at Grenache. I wasn't sure what to expect if I'm being honest. I knew the food would be good, but to fall in love with a place I have to like the atmosphere too. So the weather was pretty pants, and we arrived looking a little dishevelled (husband also looking slightly ashamed of my flowery cagoule). Within minutes we had met the utterly charming Huss; their front of house maestro who loves a chat and a few laughs with his customers. We liked him a lot! A young chap called Cameron introduced himself whilst delivering some freshly baked bread, which was soon followed by an appetiser of deep fried smoked salmon fishcakes. We already loved the place. 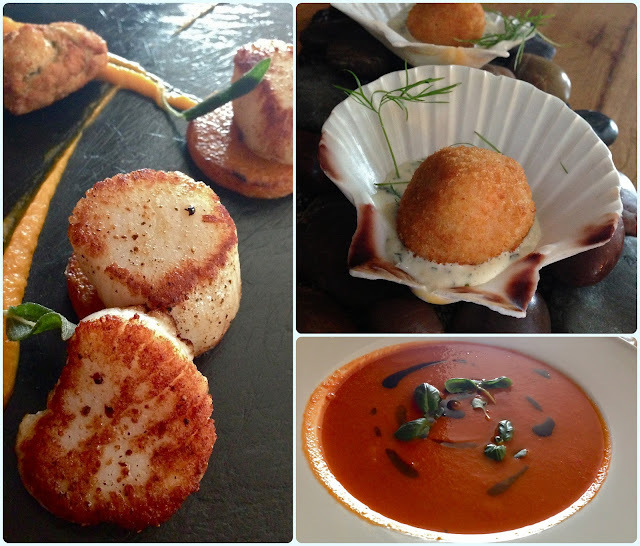 For starters Paddy ordered the scallops and I had the roasted tomato and red pepper soup. Despite Huss' jokes about the scallops being terrible, they were perfect. We knew you could only ever jest about such things if you were confident as hell that they were bob on. My soup was beautifully light and perfect for summer. Cards were on the table. Huss bet us that if our beef wasn't absolutely perfect, he would give it to us for free. His money was never in danger, was it? It was delectable. Soft and easy to cut with a crispy edge and a medium rare centre. This was a beautiful example of a roast dinner. The sides didn't let it down either. A proud Yorkshire pudding sat on top of the best mash ever, and was surrounded by cauliflower cheese, roasties, cabbage, carrot mash and drizzled in rich gravy. I strategically had to leave a bit in order to fit in the dessert I had been eyeing up. 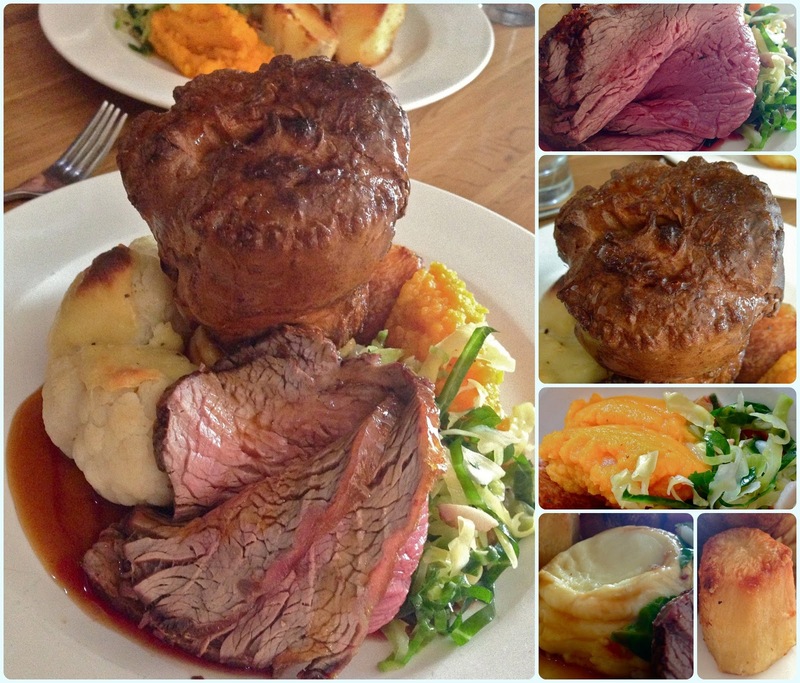 This has to be one of the best value meals in the North West, at just £10.95 for the roast. You've got to love extra desserts. Well, I do. 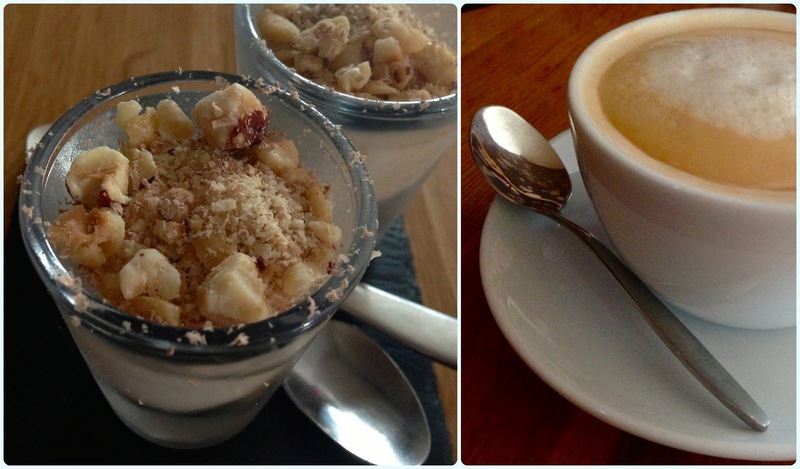 Ever the greed-o-guts I was thrilled to see a mini tiramisu appear! Beautiful. Now then. Dessert. 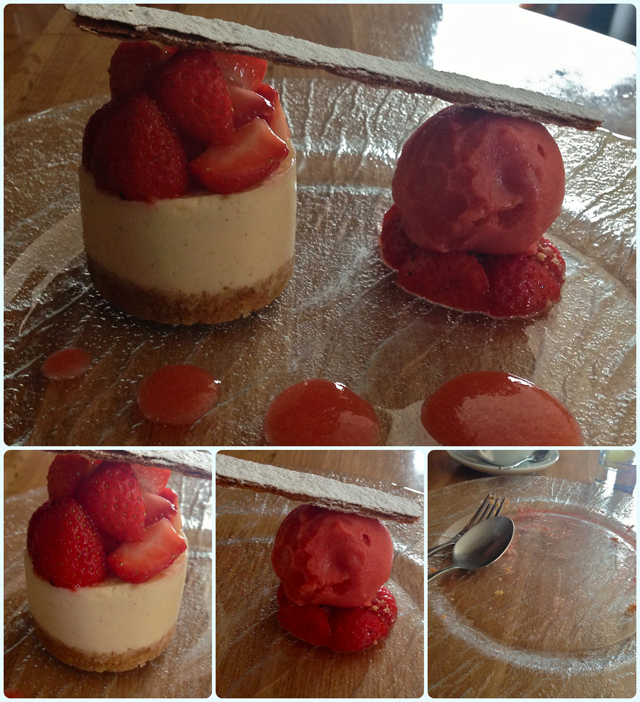 I had spied a vanilla cheesecake served with peppered strawberries and strawberry sorbet. I'd tried peppered meringue at Little Social last week - I was intrigued. This dessert sky-rocketed onto my all time favourites list. I ate every scrap despite being full to bursting! I cannot fault a single thing. The strawberries were sweet and juicy with a warmth from the pepper, the cheesecake was smooth and the base just firm enough. The star of the show had to be the sorbet; tangy but densely flavoured with my favourite fruit. 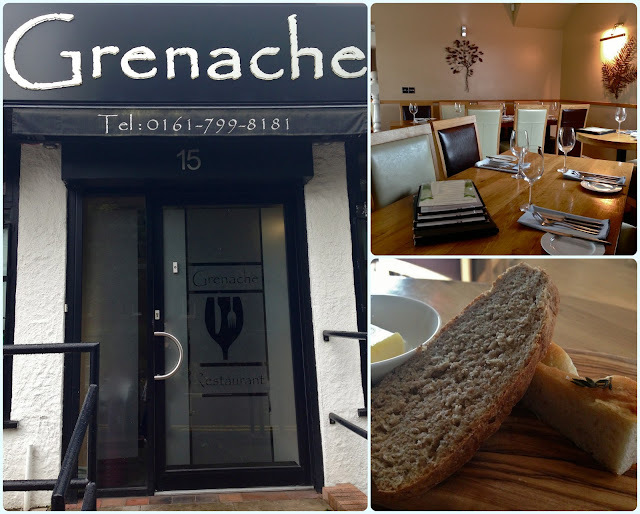 We adored Grenache; the atmosphere, the food and the people running it. It has an air of old fashioned glamour; a bygone time where every town had its best restaurant - the place where everyone wanted to go. Although it's sat in a quiet side street in Worsley, I get the feeling that most of its patrons now travel to get a piece of the action. To put it in perspective, we went to Northcote for Sunday lunch a few weeks ago, and spent twice the amount we did today. The meals were comparable in terms of courses and presentation, but I have to say Grenache is considerably more comfortable. You don't have to get dressed up, and no-one is on best behaviour! Don't get me wrong, the Michelin starred establishments have their place in my heart, but Grenache are bridging the gap - excellent food which is affordable. We're definitely going back to Grenache. The people sell it as much as the food does. Their head chef Mike is clearly a talented chap with a passion for his craft, and Huss was born to run front of house. Backing them up is a strong team of professional young people who do them proud. Wow, that's a brilliant price! Looks spot on as well, we're definitely going to have to go now. Is it laid back enough for children do you think? Definitely. It's a chilled out kind of place!